The recent public execution of a military officer is stirring discontent in North Korea as the regime tries to tighten control over the military. Radio Free Asia reported Tuesday that a politburo member of the North Korean People's Army artillery command in Pyongyang was publicly executed in an airfield due to insubordination to the Workers Party and "immorality." He was a fairly senior officer and appointed by the party . "The execution was conducted in front of hundreds of people," a source told RFA. "The incident is a warning to the military that corruption will not be tolerated" because it creates a slippery slope toward the destruction of socialism. Thae Yong-ho, a former North Korean diplomat, earlier said that Kim Jong-un is becoming increasingly frustrated with the military. 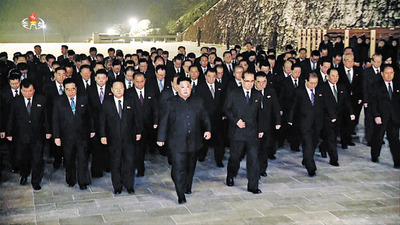 As proof, Thae offered Kim's visit to the Kumsusan Palace of the Sun to commemorate the seventh anniversary of his father Kim Jong-il's death without military officials by his side. The military came to undue power and developed into an unruly state within the state due to Kim senior's disastrous "military-first" doctrine.